Get ready to follow Mary and Joseph on their way to Bethlehem. They are in a hurry! Mary is expecting the baby Jesus and they need your help to find many things along the way. 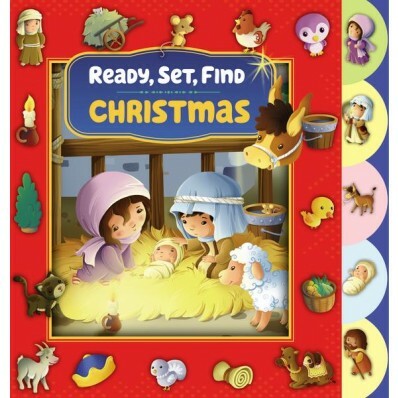 This holiday board book is perfect for young children who will love finding the 48 objects hidden on the pages while reading the classic story of Christmas, accurately retold and with scripture references. On your mark, Ready-Set-Find! Ready, Set, Find Christmas is a sweet book for preschoolers. I think children will have fun searching for the objects pictured on each spread. The drawings are charming, especially the animals. Scriptures are used to tell the story of Jesus birth. The book ends with the wise men visiting Jesus at the manger. I'm not sure how accurate that is, but it is a cute book and would be a great way to share Jesus' birth with a child. Also, the book has nice sturdy tabs that make it easy for little fingers. I received this book for free.